Having already recorded and produced over 10 acclaimed records, had multiple live sessions and airplay on BBC Radio 2 and 3, and his music regularly featured on Sky Arts and Sky Sports, it’s hard to believe that young Bristol-based folk singer, producer and multi-instrumentalist Sam Kelly has only been performing live for a few years. As a child, Sam spent many a night enraptured, listening to his Irish grandfather tell folk tales, sing songs, and play tunes on his melodeon. This awe and passion for Celtic music, coupled with a love for the heavy riffs of classic rock and blues, and a voice described by Mike Harding as ‘one of my favourite voices ever’ has led Sam on to produce some of the most exciting music on the British folk scene in recent years. Jamie Francis is a Bristol based banjo player, guitarist and songwriter. He started gigging at the age of 12, and grew up surrounded by both the blues music popular in his home town of Maryport, and the Irish folk music played by his father. His playing and songwriting styles reflect these varied influences. Jamie Francis attended the Brighton Institute of Modern Music where he received a 1st Class BA Hons in Music Performance. At University he met his long time musical collaborator Sam Kelly, whose band Sam Kelly and the Lost Boys has won a BBC Folk Award and seen Jamie play all over the world. 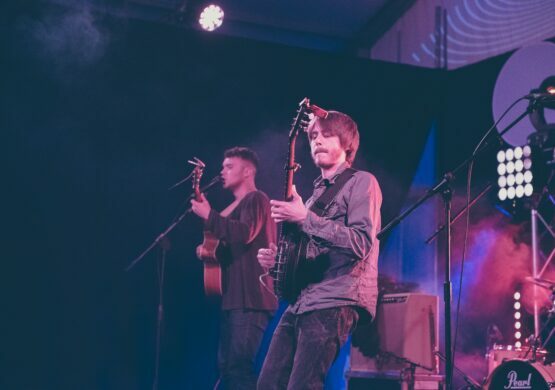 As well as the international gigging, Jamie has played live sessions on BBC Radio 2 and 3, played in Seth Lakeman’s band and supported numerous folk legends such as Cara Dillon and Sean Lakeman & Kathryn Roberts. From the duo show, expect to hear haunting harmonies, soaring tunes and melodies, charming anecdotes and instrumental performances of the highest calibre, all led by Sam’s unmistakable vocals. This is not a show to be missed.